Here is the Latest on the Alabama Weather Situation at 10:30 a.m.
We are now in watch, wait, and prepare mode for a snowfall event that could bring significant travel impacts to North and Central Alabama starting late tonight and lasting through much of Tuesday and into Wednesday. It’s hard to imagine that we are talking about snow when it is a pleasant winter’s day across Alabama, but a powerful arctic front is pushing towards Alabama that will bring really cold temperatures to the state. 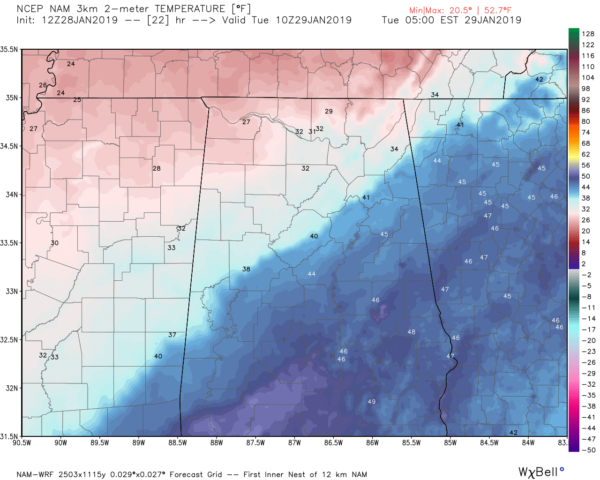 The arctic cold front will push across Alabama on Tuesday, arriving over Northwest Alabama around 9-10 p.m., Birmingham around 4-5 a.m. and Montgomery around 9 a.m. Rain will move into Northwest Alabama by 9 p.m. There could be a few showers as early as this evening. The rain will transition to snow as freezing temperatures move in. The temperature at Birmingham at midnight will be at 49F, by 3 a.m. will be at 43F, and just two hours later it will be at 34F. It will be windy as well with northwest winds averaging 15-20 mph and gusting to 30 mph. 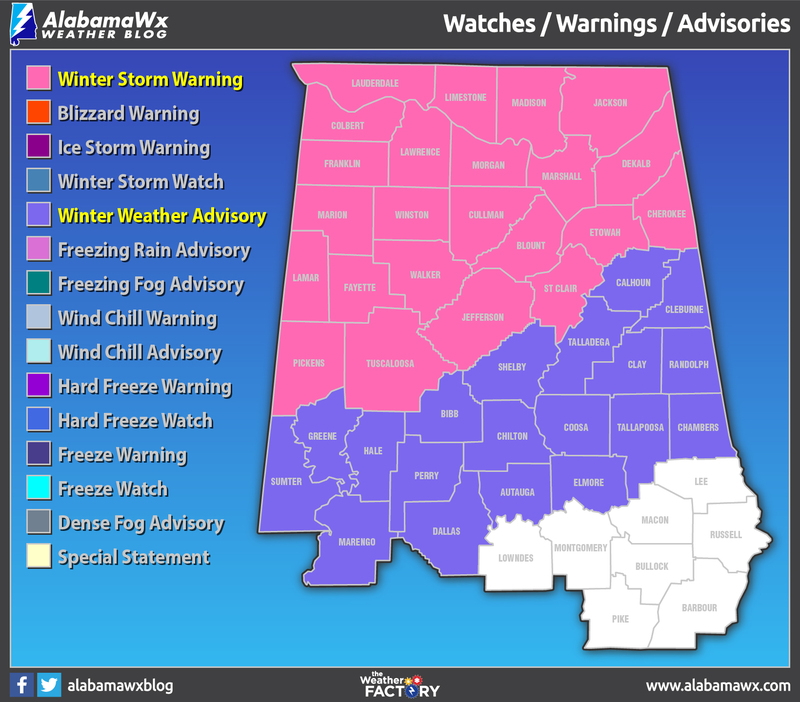 Winter storm warning for areas near and north of I-59 in Central Alabama and for all of North Alabama. The winter storm warning reflects the area where we have the highest confidence about accumulations and impacts. Additional counties may be added to the winter storm warning as we go through the event. A winter weather advisory south to Montgomery. For some reason, people don’t take the advisories as seriously as the warnings, but they should. Advisories must be taken seriously because there will still be significant impacts in the advisory area. Here is the best guess for now. It may be adjusted a little south as we go through the day. Up to three inches may accumulate in some spots. But don’t get caught up in accumulation numbers. Icing on roads will be a problem wherever snow covers roads. Bridges will ice first. A large part of forecasting an event like this is seeing where the heaviest snowfall sets up on radar. 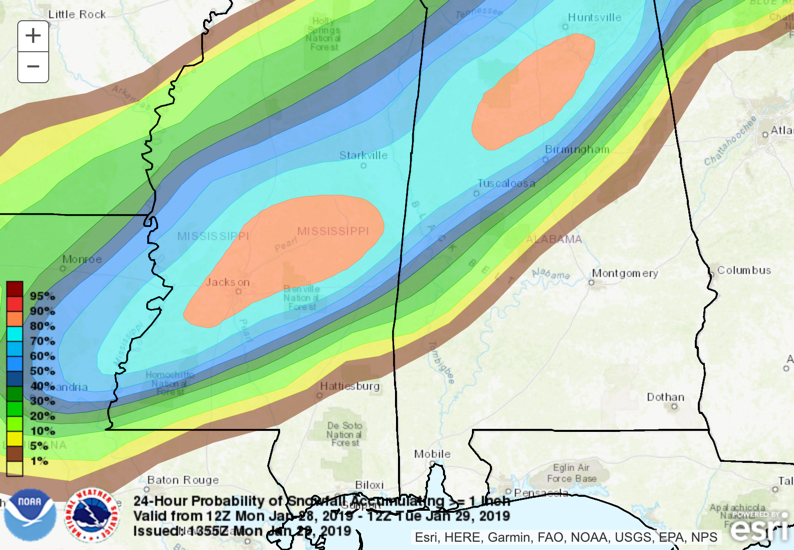 We have set the Boom (or maximum expected) snowfall forecast amount at 4 inches for Birmingham. The bust amount will be ¼ of an inch. Undoubtedly, there will be some locations that get four inches and experience the boom forecast. There will be places in the winter storm warning area that could be closer to the bust forecast. It is the nature of snow forecasting. Travel will be impacted by roadway icing during the event starting Monday night just after midnight over northwestern counties. Problems will spread southeastward with the snow, especially in areas that see heavier snowfall rates. The sun will come out after the snow pushes through. This will help melt the snow and raise temperatures into the middle 30s. But after the sun goes down, temperatures will fall into the teens quickly and moisture on the roads will refreeze. Roadway icing will be a problem late Tuesday afternoon through Wednesday morning as all of the wet and snow packed roads and bridges refreeze. Travel will be extremely dangerous Tuesday night and Wednesday morning. Winds will be running 15-20 mph with gusts to 30 mph. Wind chills will be in the teens during the day tomorrow. Winds will die off tomorrow night, but temperatures will fall into the teens and lower 20s. As early as midnight tonight in northwestern counties. The first changeover to snow should occur around midnight – 1 a.m. in places like Marion and Franklin Counties. 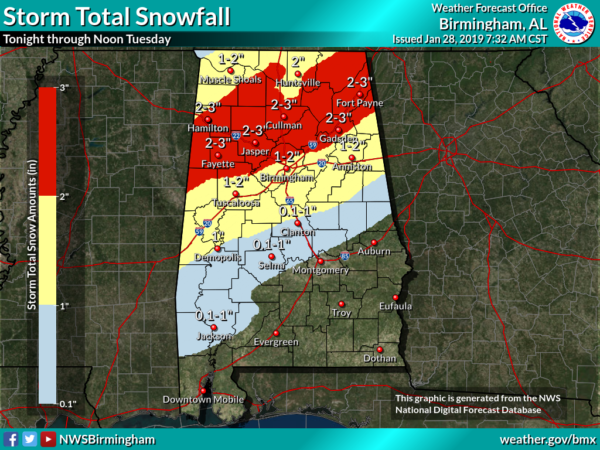 The snow will be spreading southeast should reach the Tuscaloosa and Birmingham areas around 3-5 a.m. The heaviest snow should occur between 5 and 11 a.m. across Central Alabama. Snowfall rates will be high and the event could produce 1-3 inches of snow in a short time. 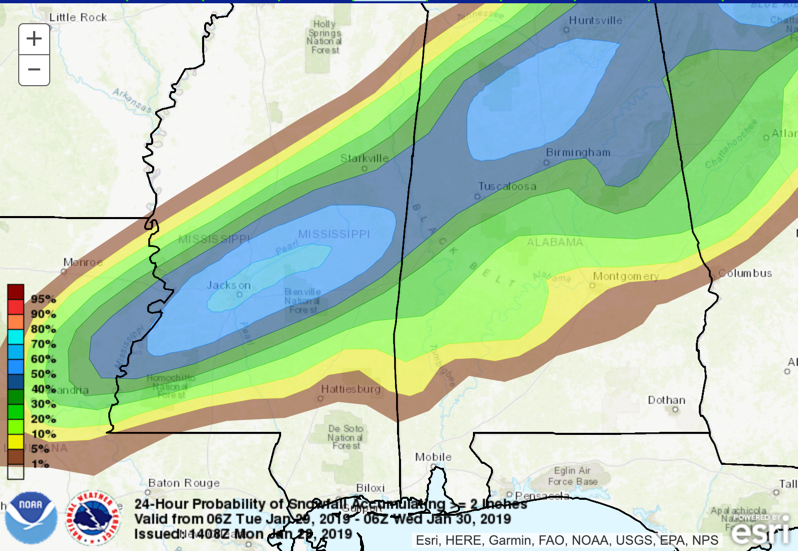 Travel will become hazardous starting late tonight and spreading across Central Alabama during the early morning hours. Then, travel will be hazardous Tuesday evening and night into Wednesday morning. We will have updates every couple of hours today and hourly once the event starts tonight.